A while back Joann's was having a sale on flannel, and so even though I have tons of projects in progress and hardly any energy and a huge fabric stash...I bought some! I took a few evenings and whipped up some jammies for my boys. James has Batman, of course, and Jack has sharks. The shirts are extra t-shirts that I had from a school decorate-a-shirt project that were just in a pile in my closet, so I spruced them up a bit because they like matching tops and bottoms. The "J" on the back was his request! I freehanded it in sharpie and then used a simple zigzag stitch on my machine to appliqué it on. 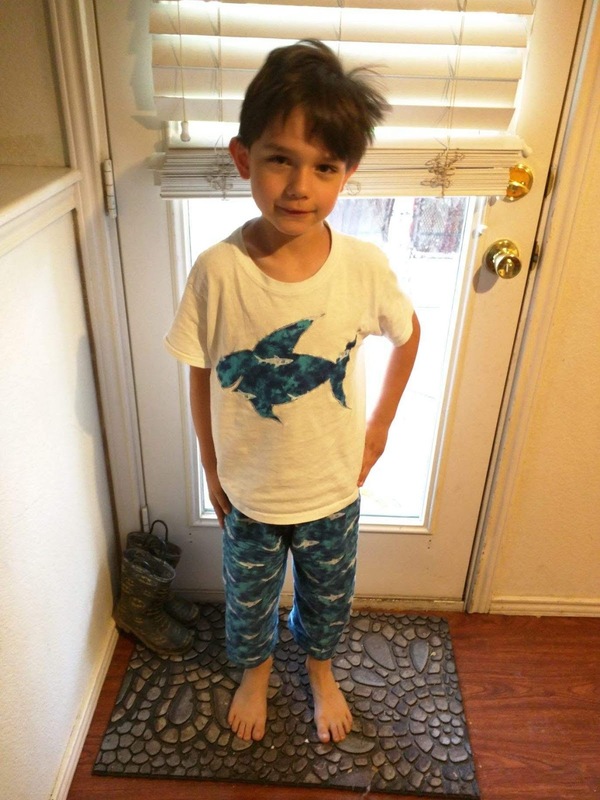 And for Jack, shark print flannel! The pants are a little short since I modeled them after some of his size 6 pants and really he wears more size 7/8 pants. The shirt is a plain white t-shirt that I appliquéd a shark onto the front, like with James' shirt, using a zigzag stitch. I drew the shark freehanded too. Skillz, huh? The picture is terrible, but I think you get the idea. I also got flannel to make myself some pajama pants but haven't done it yet and I got some pretty dark blue and green plaid and did make a tiered ruffle renfair skirt for myself...but it is too small. Hopefully it will fit me when I'm not pregnant anymore. We'll see. I also plan to use some of it to make a cute Outlander inspired doll dress...eventually. For now I really should get back to work on that baby quilt. He's coming in 6 weeks and I haven't even started. Yikes!